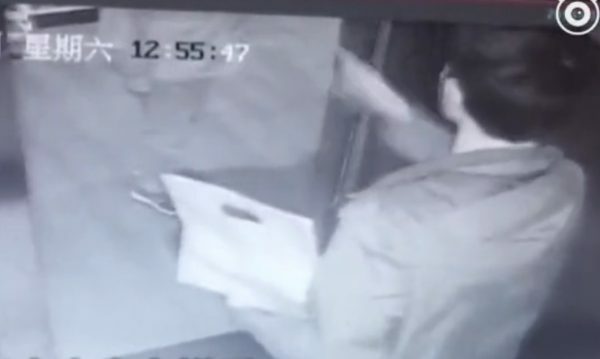 A delivery man was caught on security camera kicking a 71-year-old woman to the floor after an argument in an elevator in south China’s Guangdong Province. The argument was over the delivery man assuming that the woman had tried to close the elevator doors on him, multiple mainland Chinese media outlets reported. The man, whose name was not given, was later arrested for intentionally harming others, the reports said. 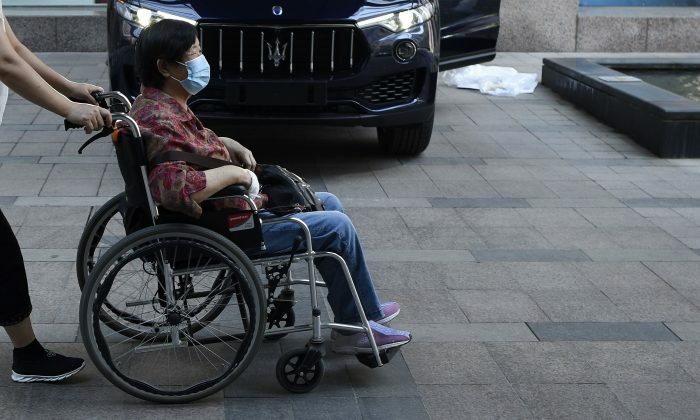 The woman, last name Zheng, suffered a stress fracture to her vertebrae and was being treated in hospital. The incident, which occurred on March 16, arose as the woman entered the elevator and pushed the button to close the doors—without looking behind her. She then pushes the button to the second floor. Then, the food delivery man walks into the elevator behind her, and is hit by the closing doors. “When the door was about to close, [the delivery man] rushed into the elevator,” Zheng’s daughter told Pear Videos, a major mainland Chinese news video outlet. The video footage did not contain audio. As Zheng notices him, she reaches to push the button to open the doors, but he has already entered at this point. The man then reaches in front of her and pushes the fifth-floor button. The two appear to be talking to each other as the elevator doors open at the second floor. Zheng does not get off, and the man steps in front of her, bumping her back, and pushes the fifth floor button again. He then presses the button to close the doors. Zheng reaches out and presses the button for the second floor just before the doors shut. Zheng eventually walks out of the elevator, and the man makes an aggressive stance behind her. She turns around and appears to talk to him once again. They both point at each other during the interaction. Then the man loses his temper, and opens the door. 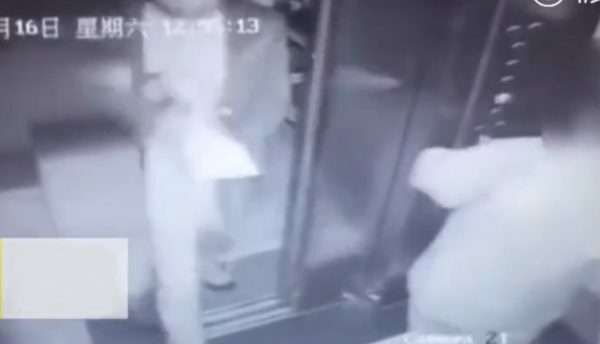 In other surveillance footage, Zheng is seen being knocked to the ground by the delivery man, after which the man quickly gets back into the elevator. Zheng then slowly begins to stand up, but collapses again before she can get to her feet. A man rushes out into the hallway and helps her up. According to multiple reports, the man went to to deliver the food to the customer, and went on his way as if nothing happened. He was later detained by police. Zheng was taken to a hospital in Guangzhou, where it was found that she suffered a stress fracture to the vertebrae. As at early April, she was still being treated in hospital. According to an April 3 report from the Guangdong Television Station, the delivery company, named Meituan, has paid $6,700 for Zheng’s medical fees. The company is similar to Yelp and Groupon.